NTP is a leading global supplier of radioisotope-based diagnostic imaging and therapy products, and exports to 50 countries around the world. Global nuclear medicine and medical radioisotope markets are expected to grow at a CAGR of between 9% and 12%, with medical isotopes projected to reach a value of over US$17-billion by the end of 2020. While imaging and diagnostic radiopharmaceuticals account for the largest market share, future growth of this market is expected to be driven by pioneering therapeutic applications of active pharmaceutical ingredients (APIs). NTP Radioisotopes is a leading producer of the world’s most important medical diagnostic radioisotope precursor, molybdenum-99 (Mo-99), and is the first large-scale producer of all-LEU Mo-99. The daughter (decay) product of Mo-99m, technetium-99m (Tc-99m), is used in more than 40-million diagnostic procedures annually. 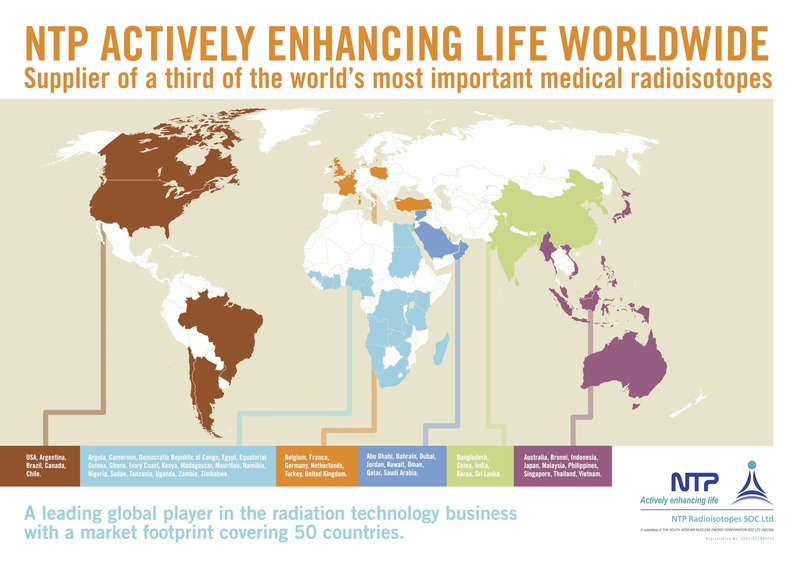 NTP exports radiochemical and radiopharmaceutical products to some 50 countries throughout the world, which account for between 8-million and 10-million life-saving diagnostic imaging studies and therapeutic treatments each year. NTP also produces iodine-131, Gluscan ® FDG, and is pioneering production of beta-emitter lutetium-177 in South Africa. Our radiopharmaceutical division produces and supplies a range of API products, from Tc-99m generators and labelling kits to patient-ready doses of radiopharmaceuticals.